Laine is a publication that makes me want to wait until the kids are out, brew a cuppa, curl up on the couch, and really savor. I want to read each article without interruption, contemplate the recipe, and really enjoy the stunning photography. 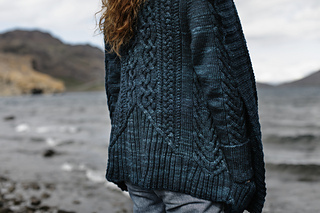 Laine is always full of inspiration, knitterly and otherwise. After meeting Jonna & Sini at Edinburgh Yarn Festival in the spring and loving the beautiful publication that they create, Alexa and I wanted to contribute. We were so pleased to have Tortoiseshell, a worsted-weight lace shawl design, included in Issue 6. Laine is deliciously MOODY. The photography is excellent and the publication has this atmospheric style that is evocative and enchanting. Issue 6 was shot in Iceland and is, in my (admittedly biased) view, Jaw Droppingly Excellent. This meaty collection includes 12 inspiring designs. Despite my love for the Tortoiseshell shawl, it’s not even one of the top 3 that I’d like to drop everything to knit! First on that list would be Hryggir by Hélène Magnússon, a fascinating woman who is also interviewed in this issue. Second would have to be Sode by Hiroko Payne and third would be Afterparty by Astrid Troland. Seriously, Afterparty is beautiful, but that name… pure gold!! The Tortoiseshell shawl is simple, but satisfying and oh so cozy. The lace pattern is one that I developed myself. I began with a diamond leaf lace pattern, then experimented to see what would change if I made the increase and decrease stitches more extreme. The resulting pattern is organic and high-relief, perfect when paired with The Border Mill Alpaca Tweed. Detail of the Tortoiseshell lace stitch. If you haven’t checked out Laine Magazine yet, I recommend you give it a look. It’s the sort of magazine that I love to collect, a pretty book that brings delight beyond the really inspiring list of designs included. I did not realize you were behind this beautiful design, congratulations! I’ve been buying Laine since the issue 2, totally agree with you, it is a gorgeous magazine. I went to their website but there is no way to subscribe. How might one get this magazine in the US? and many shops ship as well!